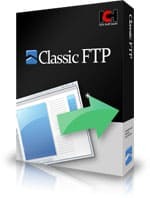 Classic FTP has been specifically designed to look and feel like a traditional ftp client while supporting the latest FTP features. Its easy to use interface makes locating and editing files on your website easy. You can also upload or download files with a single click of a button. Classic FTP lets you view, edit, upload, download and delete files from a remote server (website) or network for free. This FTP Uploading software is very easy to use and will have you uploading your files in seconds.